If you want to know what NeoScum's all about or if you're looking for some context to jump ahead to a later episode, you're in the right place. 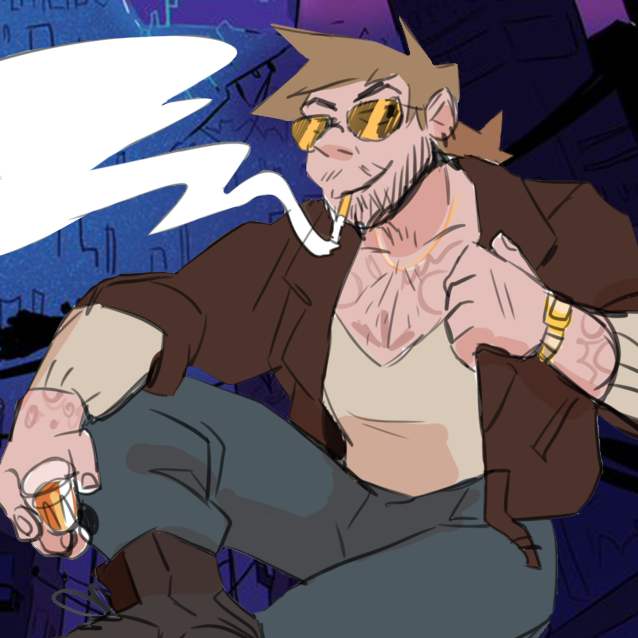 NeoScum is a narrative comedy podcast; an audio adventure in which five Chicago improvisers use the structure of the tabletop roleplaying game "Shadowrun" to create a wild, sprawling journey through a neon-80s action movie interpretation of the future. It takes place in an absurd but familiar future-fantasy America, where traditional fantasy elements (magic, elves, dragons, etc) collide with classic cyperpunk tropes (super-tech, body augmentations, megacorps, etc). But NeoScum tells its story with an absurd satirical bend, poking fun at its influences while reveling in them with post-ironic zeal. 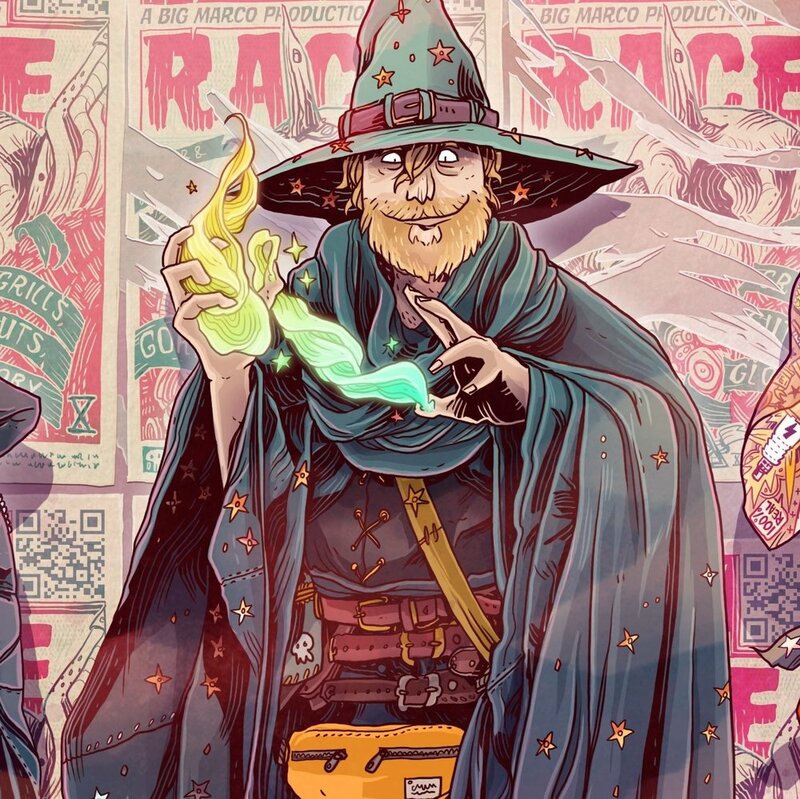 At its core, NeoScum is the story of damaged outsiders on a road trip west, growing into the found family they never knew they needed. NeoScum is Blair Britt, Mike Migdall, Gannon Reedy, Eleni Sauvageau, and Casey Toney. You can learn more about them in Meet the Cast, but here are their roles in the show. As Game Master, Gannon is the driving force behind the narrative. He dictates the world around the characters and creates the obstacles they must overcome. Gannon plays most of the non-player characters (NPCs) the cast interacts with as he unravels a wild and unforgettable story that adapts (dramatically) to the whims of its players. A Game Master is not always an iconoclast, but in this case, they are. A man with a million aliases, "The Handsomest Trucker On The Road" has one name that stands above the rest: Dak Rambo. And he doesn't care who knows it. The renegade driver with a storied past is a new world take on an old world way. There's never been much in this world Dak couldn't hop in his truck, Xanadu, and drive away from. But when NeoScum’s journey takes him down an old familiar road, Dak’s past catches up with him in ways he'd never expect. The analytical and acerbic cyber-troublemaker affectionately known as "Z" may not look like much, but the hacker is deadly, both in and out of the digital world. A victim of a past he cannot remember, his body is host to a variety of cybernetic augmentations. The most conspicuous: a spherical, flying drone in his left eye socket, distinguished by a Z-shaped scar. Who made him this way — and for what purpose — hides in the fractures of his shattered memories. 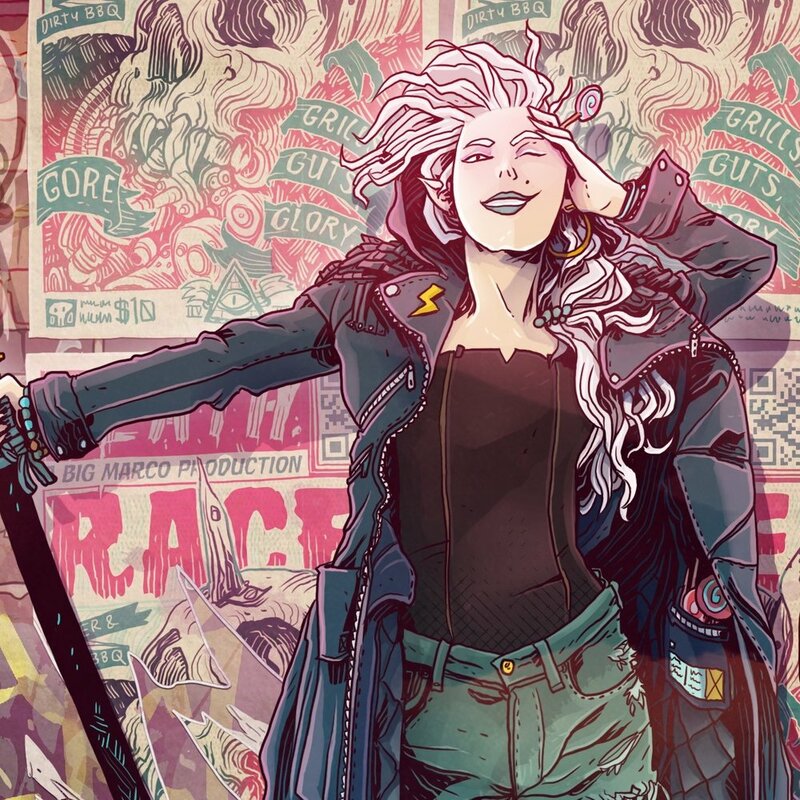 The candy-crazed katana from across the pond, "Pox", earned her moniker from the innumerable pockets of her iconic jacket – a fashion-forward fortress she lines with stolen trinkets and treats. Her playful and impulsive nature masks a vacancy she can never fill; the young runaway fled the kingdom and her sister with it, who remains trapped as a victim of their powerful and sadistic father. She aims to return and run him through. If he doesn't find her first. The public-access actor with the magic touch, Squirt Purpler, adopted the pseudonym "Tech Wizard" after his most notable role: the villain in a children's TV show. Chubby, broken, and blonde, TW lived a sheltered life in his Nana's care, hiding his magic abilities from the public's hostile eye. That is, until adorning his dead father's robes for the role. He wouldn't begin to fathom their significance until leaving his life behind to travel with the NeoScum – right toward the childhood trauma that formed him. A true "God of the Road", Xanadu is an unstoppable 50 ton tank on 18 wheels of fury. Dak Rambo's trusty ride has always been his most consistent companion, and is now a second home to the NeoScum and their guests as they travel across future-fantasy America, one stop at a time. NeoScum is a very different show today than it was in the beginning. 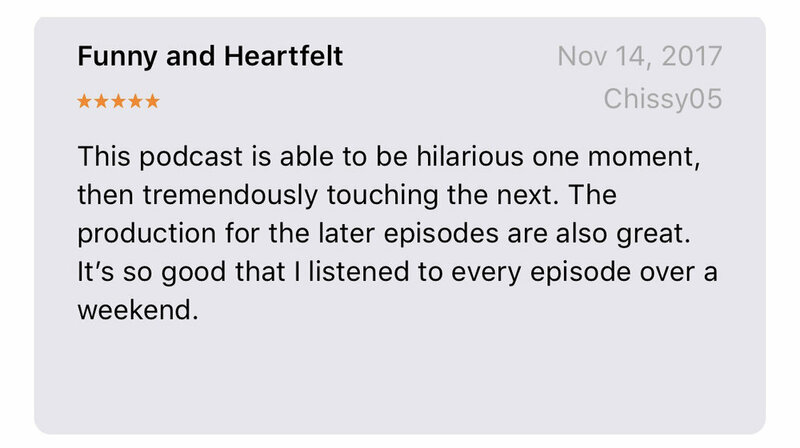 As essential as the early episodes are, starting at Episode 1 as a first-time listener doesn't give you a true sense of what the show has become. 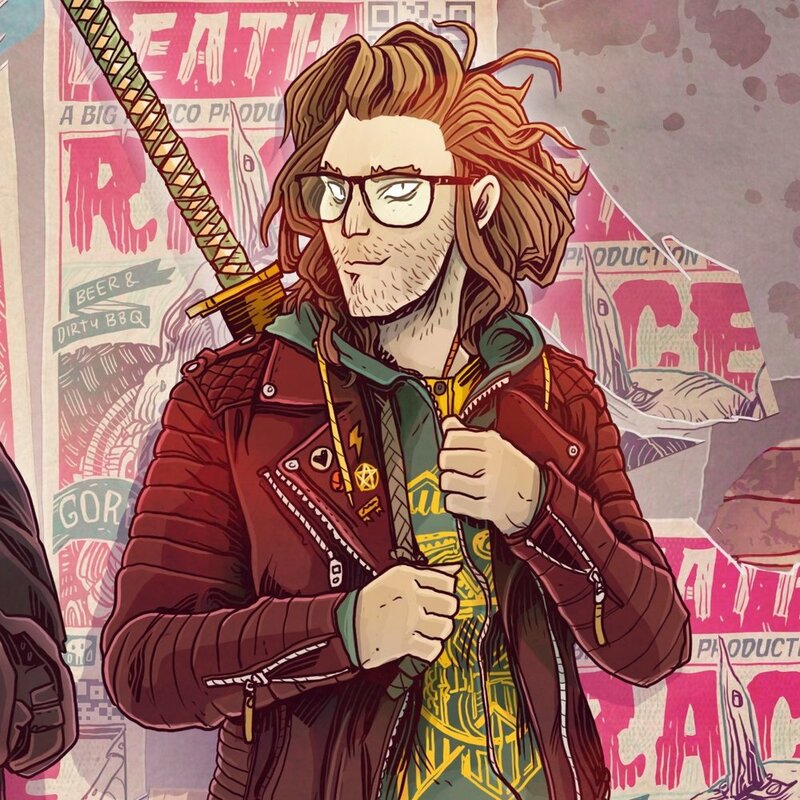 If you're not yet sold on NeoScum, we recommend listening to the NeoScum Best of 2017 Special or, if you'd prefer the experience of listening to a full episode, you can start at one of the recommended alternative entry points for the series, after which you’re welcome to start back from from the beginning whenever you'd like! NeoScum remains wildly funny and delightfully crass throughout, but grows exponentially more emotionally affecting as it goes. As the companions become family, confronting the traumas that haunt them, rich characterization and drama emerges as a major pillar of the show. Not only that, but whereas the first few episodes were recorded on a single area mic and edited by Casey with zero experience, NeoScum is now widely known for its exceptional production and extensive use of sound and music. By Episodes 18 and 19, it's hard to imagine the show without it. These brief clips from later episodes demonstrate qualities that, alongside the breathless comedy and world building, would come to define the show. If you want to check out NeoScum without starting from the beginning (for now) here are some A+ alternate entry points. The first episode recorded in the One Shot Network's Pocket Dimension studio marks the first significant leap in sound quality. A far cry from modern NeoScum but much more bearable for audiophiles than the first four. EPISODE 10 - Lights, Camera, Magic! The gang's arrival in Chicago to film Tech Wizard's show marks a number of early high points for the series. Apart from the comedic and dramatic highs, the events in this episode and the next change the entire course of the series. Dramatically. Stephen Kropa's guest episodes (this and Ep 15) are what some refer to as the start of the "Golden Age" of NeoScum. Dak's Sasquatch brother Rhon amplifies the energy of the show, their shared history injecting pathos among the poop jokes. This ep has a bit of everything. Wacky antics, tense negotiations, exhilarating combat, emotional catharsis, plus heavy use of music and sound effects. It and the following two (Ep 19 / Ep 20) are standouts; the show blossoming into what it is today. The first of Rashawn Scott's episodes is tightly paced, playful, and polished, with an extra layer of introductory dialogue that makes it accessible for new listeners. It and Ep 28 mark the conclusion of "The Denver Arc", making it a good starting point. Bend or Break is a fresh, fun, and touching episode that kicks off a captivating mini-arc on the Colorado back roads. It sets up a number of powerful emotional payoffs in the thrilling Ep 35 which, in turn, sets the course for several episodes to follow. Thanks for giving NeoScum a try.